Last year we met up with the team at Merida HQ, to chat all things bikes, development and some pretty top-secret future projects. 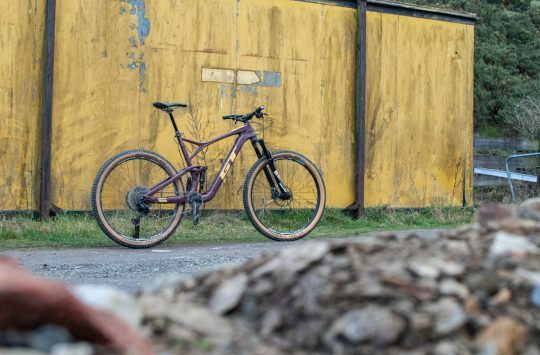 This led onto Wil, Hannah and James giving the One-Forty an exclusive early ride on some sweet German trails, and now we’ve got one in the UK to test on our home soil. So let’s get into it. 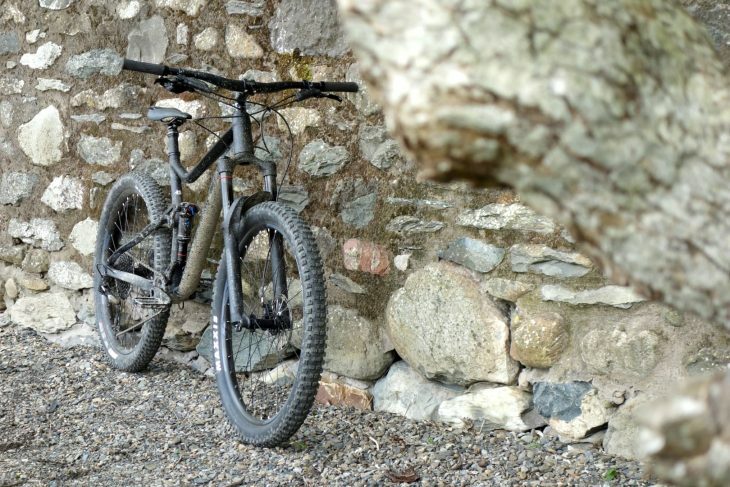 The One-Forty fits in the Merida range as the middle travel do-it-all trail bike. 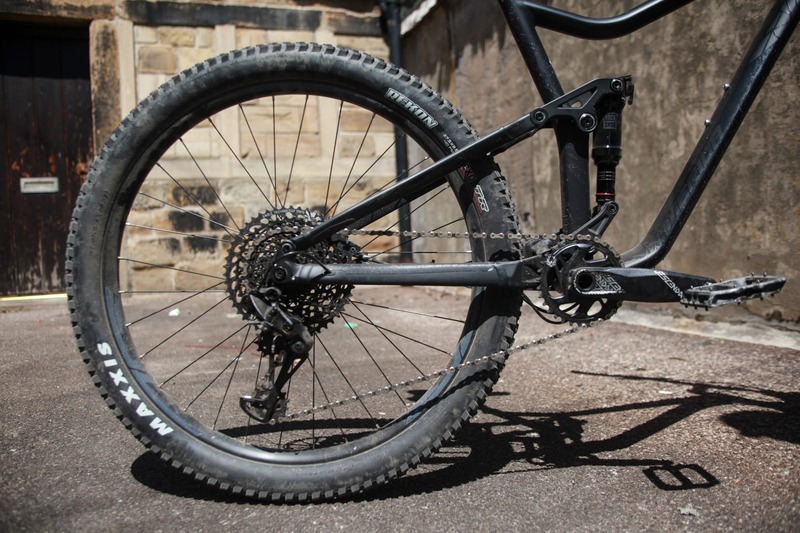 Sitting between the One-Twenty and One-Sixty, the One-Forty (unsurprisingly) has 140mm of rear travel, which is paired up to a 150mm travel fork. With two other spec options sitting below the 800, this model boasts good looks, some impressive details, and a rock-solid build kit to make this bike a very much, ride-out-of-the-box bike. I’ve been treated to the full stealth black build kit on this test bike, with a matt/satin finish on the clean alloy frame, accompanied by gloss black decals which pop in the sun light… but evade a camera lens like you wouldn’t believe. A woodland setting for the One-Forty on an early ride. For this test, we’ve got the Large frame option in the house, for me, who’s just over 6ft 1in. This size runs a reach of 455mm (compared to the Medium’s 435mm, and the XL’s 475mm). Other numbers of note are a 66.3° head angle and a seat tube angle of 75°. 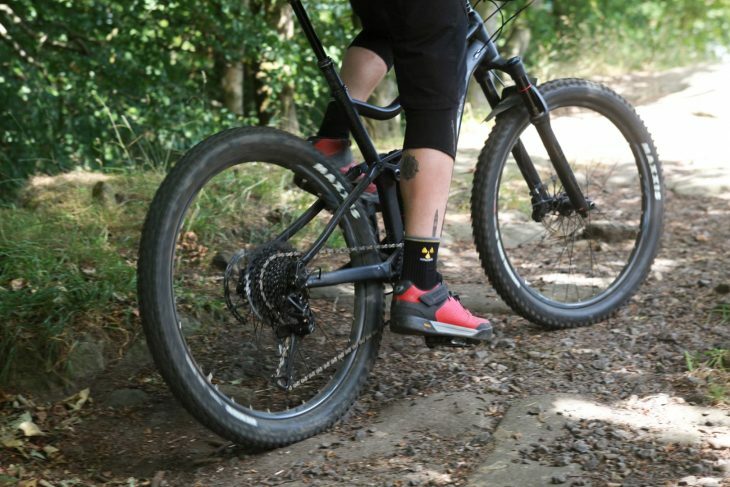 Not quite as long ’n’ slack as other current bikes on the market built for similar uses, but is that necessarily a bad thing? Slightly reserved geometry doesn’t mean dampened fun, that’s for sure. 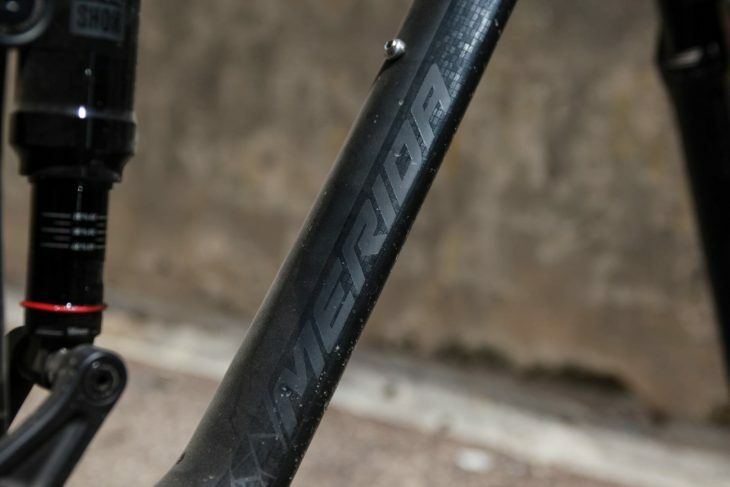 Stealthy black-on-black finish for the Merida One-Forty. The frame on the One-Forty is built from beautifully hydroformed and welded 6013 alloy tubing, with aesthetics almost identical to that of the One-Sixty, especially in this finish. 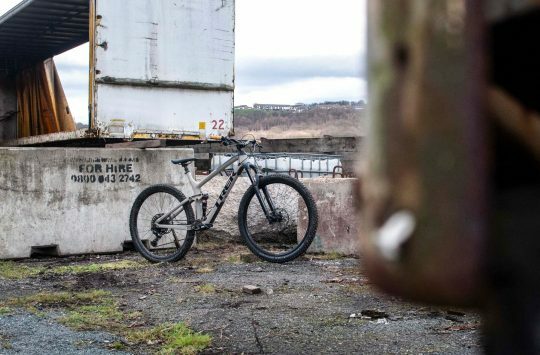 Although this is the higher spec option in the range, all three of the builds use exactly the same rigid and slick-looking alloy frame. Word on the street last year was that Merida was not going to commit to development and production of a carbon iteration of the One-Forty, and as of yet, we still haven’t heard if anything is on its way. Even with the higher spec One-Sixty models running carbon front triangles, Merida’s strong reputation for the design and production of many other alloy frames for other brands means we don’t think the designers will be in any rush to swap this platform onto carbon just yet. For 2018, Merida has made the frame for the One-Forty completely 1x specific, meaning many things. One, the aesthetic of the frame is much cleaner, with less clutter around the chainring without any additional tags for front mechs, and unneeded cabling firing its way out of the frame. Along with that, it also means the chain stays can be kept to a nice short length, at 435mm. This means the rear of the bike is nice and snappy under acceleration, and is agile on tighter sections of trail. It also allows rubber up to 2.6in wide, to slide right on in. Last but not least, not having a front mech, means not having a front shifter; meaning Merida has been able to spec KS Lev’s beautiful and incredibly user friendly south-paw dropper post lever. Win. A good looking rear end. Neat and tidy with those tight chainstays and big 2.6in rubber. On the subject of other neat additions on this frame, we’ve got tidy internal cable routing ports tucked just behind the headtube, with entry and exits built to keep cables under control. The One-Forty runs Boost 148x12mm dropouts and a super near rear axle system designed by Merida’s own team, which works an absolute treat. Tactile, easy to use and super secure. Even with cold, muddy hands. The One-Forty also runs a press fit bottom bracket, which may cause a stir between some readers. The axle feels so secure when tightened up. Compared with the previous One-Forty, the latest model features a new suspension design that’s been brought over from the longer travel One-Sixty. A new forged and welded rocker link drives the rear shock, which has been updated with a Trunnion-mounted rear shock. This is where the shock is attached to the frame via the side of the shock body, rather than directly through the top. As for spec on the One-Forty 800, we’ve got a 150mm Rockshox Revelation, using the same 35mm stanchions we’re used to seeing on the Pike model, with a 15x110mm tooled Maxle to keep things nice and stiff. Out back, the 800 runs a Rockshox Deluxe RL with the previously mentioned Trunnion mount, along with a 2-position compression damping and external rebound control. 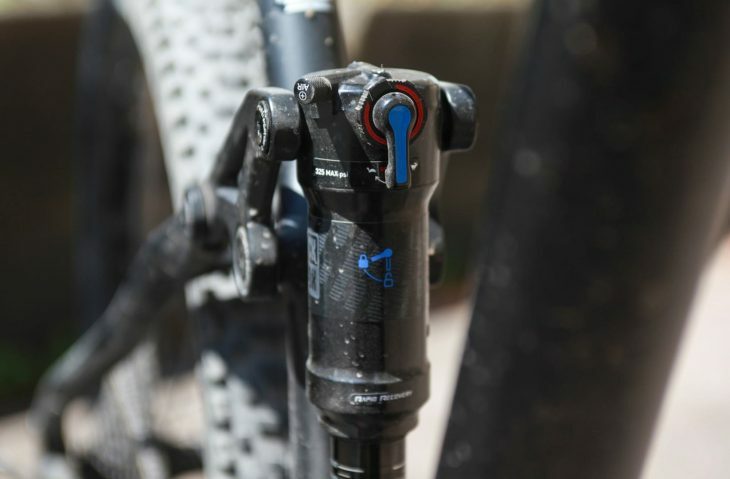 Two position compression damping on the RockShox Deluxe shock. On stopping duties, it’s the SRAM Code-R brakes that are in charge, with 180mm rotors at each end, with a lovely direct-mount calliper at the rear, keeping the back end looking super clean. 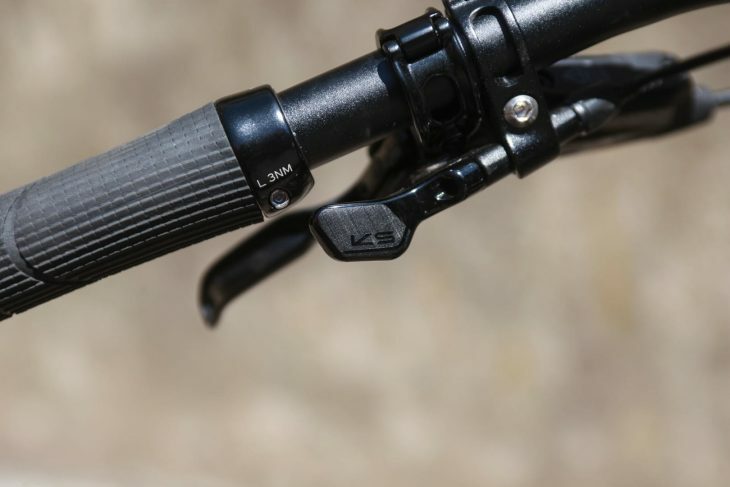 As previously mentioned, KS Lev looks after the dropper post area, with the Integra offering 125mm of drop, and the lovely Southpaw lever keeping operation smooth and enjoyable up top. The ever reliable and impressive SRAM GX Eagle 1×12 is the drivetrain of choice on the One-Forty 800, running tough Truvativ Descendant cranks. Maxxis looks after tyres, with a Minion DHR upfront, and a Reckon out back, both in the new-school 2.6in diameter. KS Lev’s southpath dropper post lever is so user friendly and comfortable in use. Confirmed weight out of the box, sans pedals sits at 14.5kg/31.9lbs. Not mega light, but for a bike of this nature, with a solid alloy frame, it’s pretty good and certainly doesn’t feel heavy on the trails. Right out of the box, I had a slight issue with the stem that came supplied on the One-Forty. With two of the bolt holes being threaded, I slammed a slightly longer stem on for the beginning of the test period, and actually found it to set the riding position up quite nicely, even if it did look a bit odd. With the One-Forty being a touch more upright in its riding position though, having a slightly longer stem actually pushed the cockpit over the front wheel to add a little bit of extra reach, and on the trails, stability. I tend to set my suspension up quite firm, to get more feedback from the trails I’m riding. On the One-Forty, I began with around 25% sag on the shock to keep the back end nice and tight. 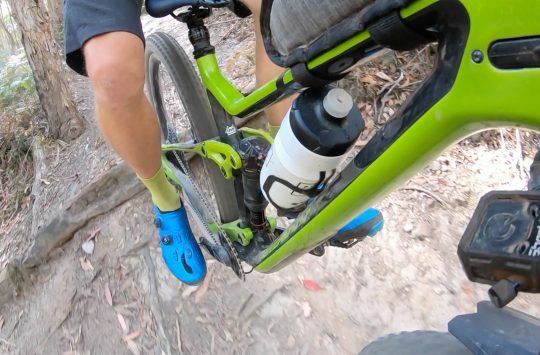 Of course, this meant I wasn’t getting full travel, but on the harder packed trails, the responsive feedback that this gave the bike was impressive. On the rougher and more technical trails, taking a touch of air out and dropping the sag to around 30%, I began to get full travel through the shock giving a much more plush feel to the stroke. 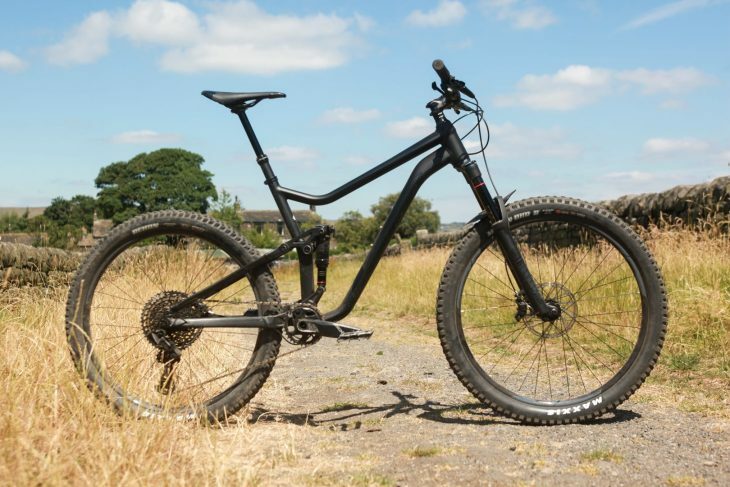 The One-Forty has a nice sprightly feel under pedalling. The One-Forty feels spritely in its acceleration and traction through the back end is effective. The Maxxis Rekon did spin out a few times on slabbier surfaces, but on drier, looser ground, grip was good. The seated climbing position is comfortable and the bike feels tall, which on the climbs I found to be a good thing. With my suspension set up being quite firm to begin with, on looser climbs the shock remained stable, which helped propel me along. On smoother climbs, there is more noticeable bobbing, but with the two position lock out it’s easy to flick between the settings and keep rolling. 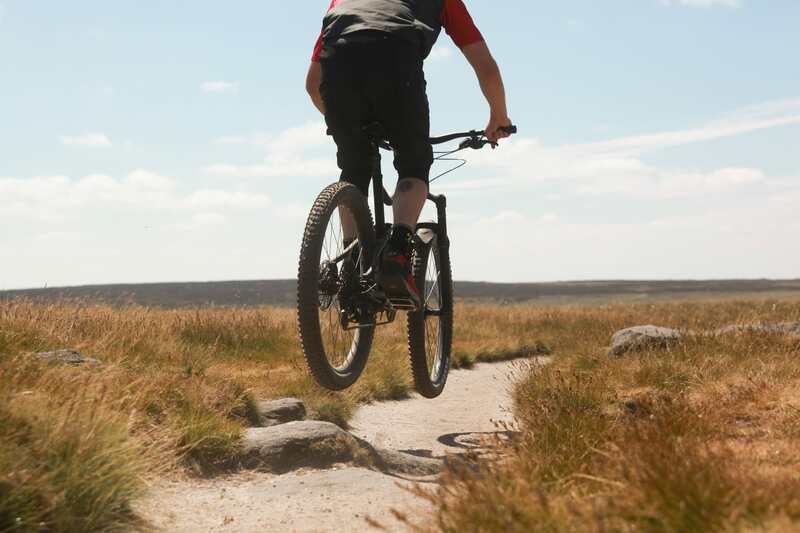 When out of the saddle, the bike pushes hard and traction is delivered by the bucket load. On more trail centre type trails, where the surfaces are harder packed, this bike rips on the climbs and sticks into the corners with masses of confidence. Cranking away on that big 10-50T block. Technical climbing was where I found the bike particularly impressive. On steep, technical corners, the One-Forty picks its lines and sticks to them so well. The addition of SRAM GX Eagle to this bike, adds an extra notch to the already impressive climbing ability. The 50T out back offers that safety net when climbing, for when things get really technical and steep. On normal climbs, the 50T does become a bit dormant, as it’s just too high of a gear to spin comfortably, without feeling like your legs are going to fly off. On the topic of GX Eagle, it can’t go un-noted just how good this drivetrain is. 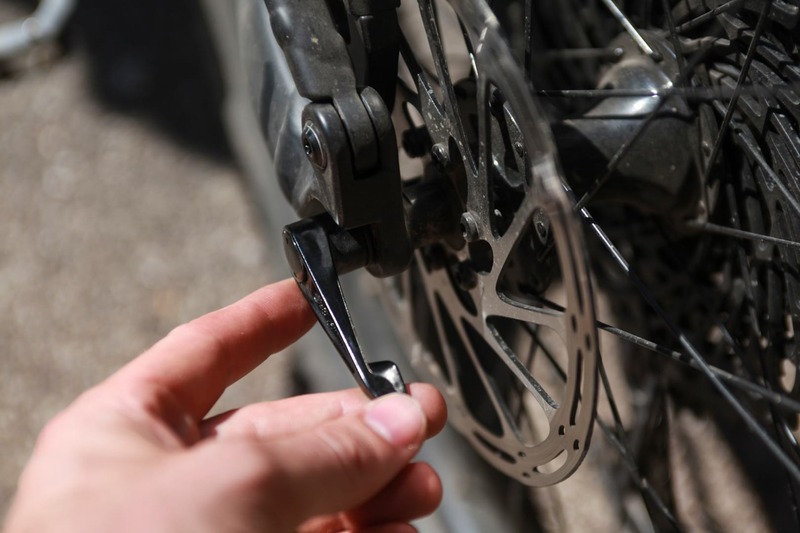 Incredibly quiet, efficient and durable, SRAM really has nailed it with this system. The whole drivetrain has been without fault through the test period, while being put under plenty of stress and strain. After all this climbing, it was time to point the One-Forty down hill and see what it had to offer. The 125mm dropper was excellent on the climbs but it wouldn’t be a bad addition upgrading to a 150mm to get the post a bit more out of the way on the descents. Having that slightly longer stem out front gave the bike good stability, and even with its 760mm wide bars (which now feels oh so narrow) there was no sign of the bike feeling sluggish or dated. The Revelation up front felt confident and as stiff as you could wish for, from the 35mm chassis. The front is direct into corners, and the nippy back end follows that front end wherever it needs to go. 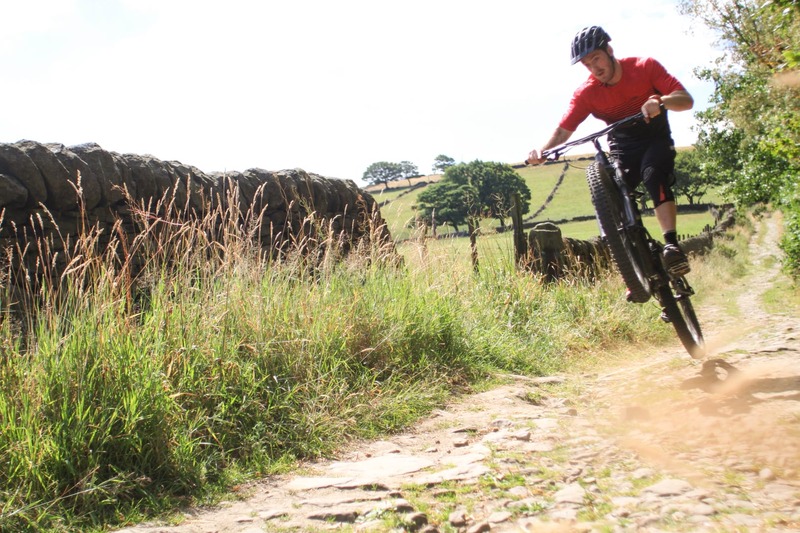 The chunky 2.6in Maxxis tyres give the One-Forty excellent cornering manners. Into the corners, the Minion DHR up front felt supportive and grippy and the Rekon out back, runs fast and enables you can carry good speed. The tight, snappy back end of the One-Forty means that throwing this bike into corners feels natural, and not as if you’re beating it to death. Tighter sections of trail were easy to manage, and I never felt as if the bike was getting me into too much trouble, that I wouldn’t be able to get out of. 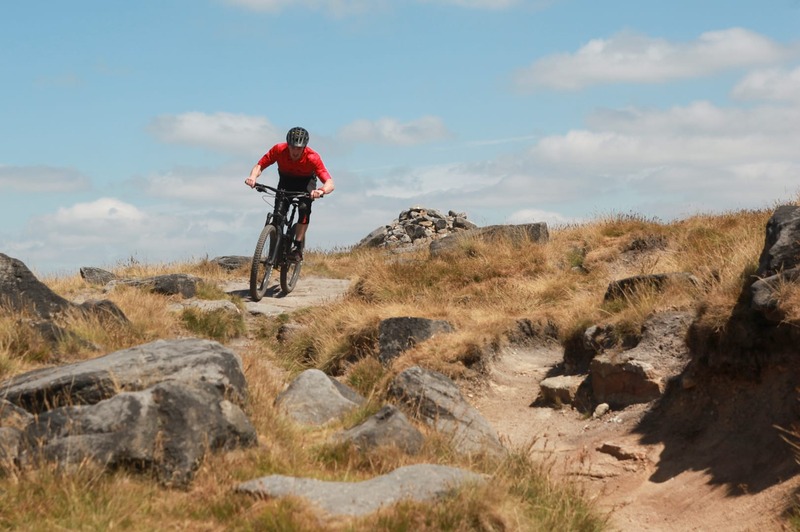 The One-Forty feels poppy and playful even on the flattest of trails. Out on my local loop, there’s a great mix of trails from open country bridleways, to technical woodland trails and even some ‘sweet jumps’ dotted around. 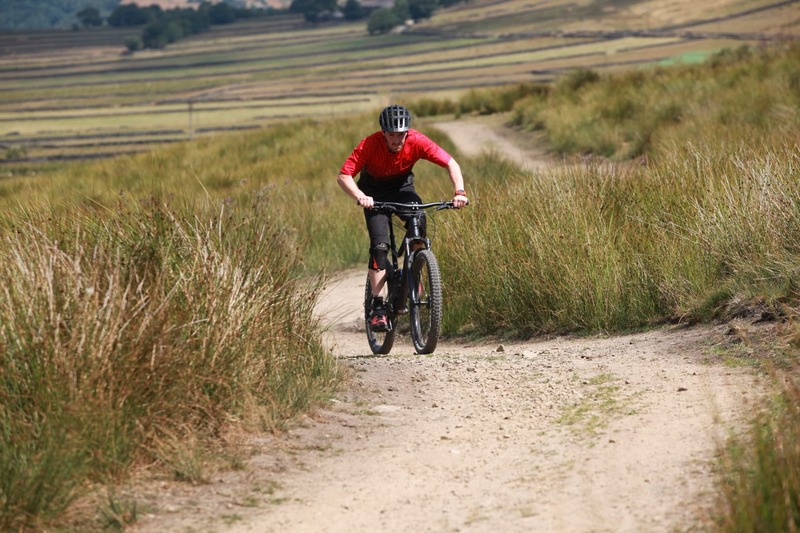 On the open pedally sections of trail, or on bridleways the bike gets up to speed so well, and it’s so comfortable to keep it there. 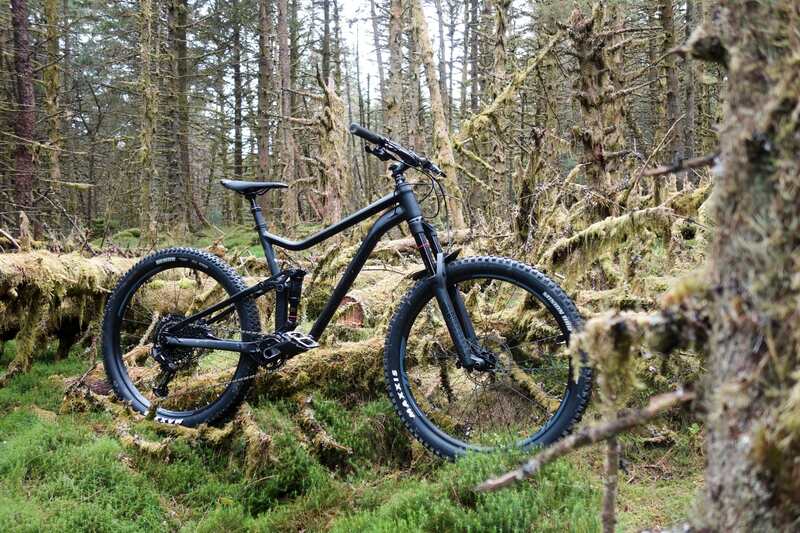 Dropping into woods, the bike feels agile and confident on the descents and even over a few jumps here and there, the bike never felt like it couldn’t contend with what I threw at it. Throwing down some good times! Beach day for the One-Forty in this lovely weather. The One-Forty has been a solid companion for the past 6 weeks or so. The climbing ability has been incredible, and the playful nature of this bike has surprised me no end. Easy to set up, and without having to make a change out of the box, it’s been class. A proper trail bike, a do-it-all kind of bike, that lets you just get out and ride, without having too much to worry about. Overall, it’s simply been good old fashioned fun. It may not have genre-bending geometry numbers, but for me, the One-Forty has a great riding character, incredible ability across all types of trail, and a confident and well performing build kit. Good job Merida. The 2018 Merida One-Forth 800. 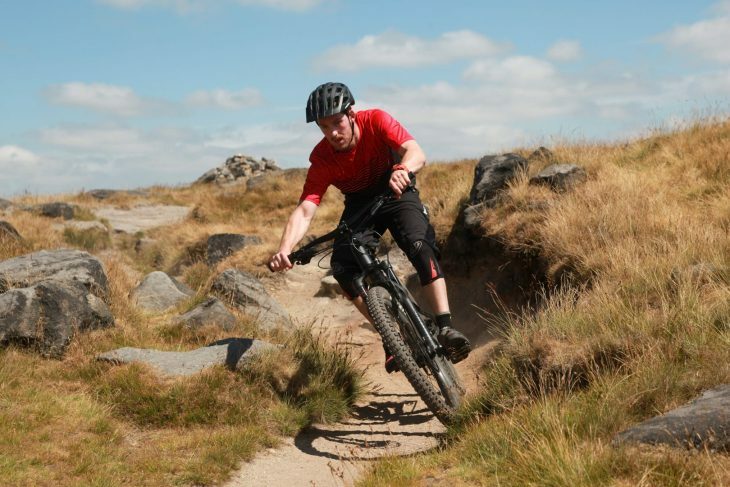 I’m sure my large 140 has a 150mm dropper, i’ll check..
and its £2800 RRP now too….